In the running community, you can find people who are running just to stay fit, and they enter races to challenge themselves. Others enter because they can raise funds for worthy organizations. Next month, you have the chance to combine fitness and benevolence and help the Elizabethtown Rotary Club and Hope Community Church's Arm of Hope that helps youths living in the slums in Ghana. The Rotary Club is holding its Mother's Day Run at 3 p.m. on Sunday, May 11 (Mother's Day, if you hadn't figured that out!). The race will be held on the roads of Masonic Village, where I personally enjoy running because of the limited traffic and the great scenery. By the way, some races market themselves as "fast and flat." Having run many miles at Masonic Village, I can assure you it's not flat, but that should not deter you from running. Take on the hills for the challenge. Use them as a metaphor -- by contributing to the Rotary and running the race, you are helping to others in the community up and over their own hills. Information is available at the link above, or you can register (online or by downloading a paper application) through Applied Race Management's race page. 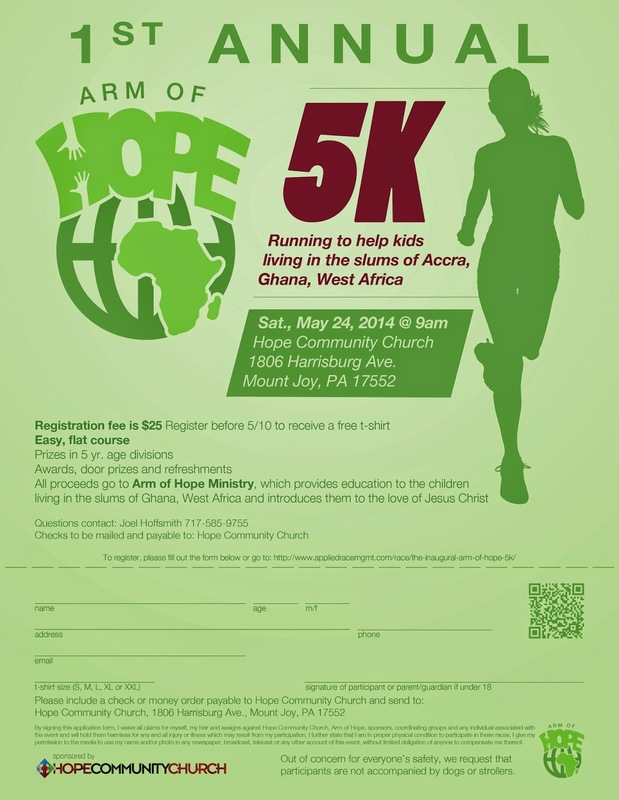 Hope Community Church in Rheems is holding its inaugural Arm of Hope 5K run at 9 a.m. on Saturday, May 24. The proceeds of this race benefit the Arm of Hope Ministry. According to race information, "this ministry provides education to the children of the slums of Ghana West Africa and introduces them to the love of Jesus." I haven't found a map for this race, but organizers say it's run on a flat course. If you're not up for the hills at Masonic Village, or if you're looking to clock a fast time in a 5K, this might be your race. You can register for this race online through Applied Race Management's race page. As I've mentioned before, I've used Elizabethtown's streets and sidewalks to run for the past two years. It seems that the training has caught up with me recently -- I have a pinched sciatic nerve, so as much as I want to run in both of these races I'm not sure I'll be able to. We'll have to see what another visit or two to the chirpractor does.